Start Perm (Hotel Ural) N58º00.630' E056º14.259' 121 meters . Perm (Hotel Ural) N58º00.630' E056º14.259' 121 meters . Finish Aboard Train #017 - Kama (Perm to Vladimir) . . . . Weather: Mostly cloudy and cool/warm in the morning. In the afternoon cloudy with the occasional heavy rain storm. Cool. While on the train variable with cloudy and rain to clear and sunny. We have a bit of a lazy morning and only head down to breakfast at 9:30 AM. We take advantage of the large buffet included with the room and fill out stomachs. Then, after getting ready and packing our bags, we head out for a brief exploration of the city. We do not have too much time, so we take the condensed tour. But, while Jacqui is checking out some shops, Lars goes out and takes his GPS reading. While he is doing this, an 80 year old lady walks up and asks for the time (by the way, it is amazing how many people do not have watches and come up and ask you what time it is). She starts to talk and soon discovers that Lars is a foreigner. She asks if he speaks German and she almost has an emotional breakdown when he replies in German that he does. It turns out that she is of German descent, born to a German that came to this city in the mid-20's for an unknown reason. Maybe a prisoner from the First World War or maybe came here for work or to re-settle. Anyway, she has lived her whole life here and appears to feel like a foreigner. Tears come to her eyes as she speaks and talks about herself. She is retired and lives in a small one room flat supplied by the company. Her sister moved to Germany after the break-up of the Soviet Union, but she says, despite pleading from her sister to move to Germany, that she is too old and will just die in this city. We then walk down the main drag of Lenina to the park fronting the Academic Theater of Opera & Ballet. The park, despite the threatening weather, has many mothers with their children playing. There is, of course, the obligatory statue of Lenin. We walked down to the theater, which is badly in need of maintenance, and around it and then over to the river. 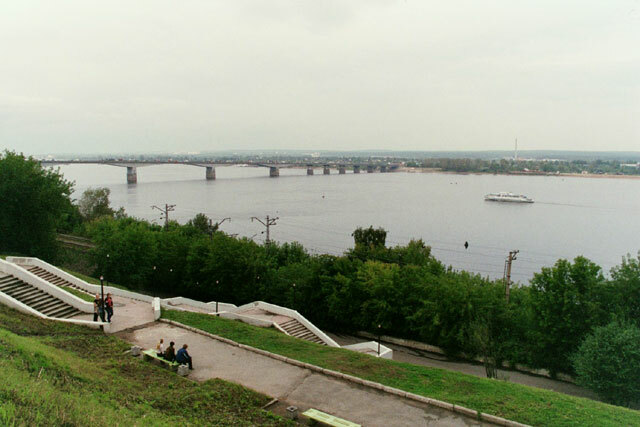 We approach the river promenade by walking besides the Art Gallery and the Ethnographic Museum. The promenade is located on a high bluff overlooking the river and the major bridge crossing to the other side. Unfortunately it seems the beer gardens are already closing for the season, otherwise we may have sat down for a drink and a snack. It is now time for lunch, so we stroll back to the street corner near the theater and head to the restaurant recommended by our guide from yesterday. It is a very interesting place. It is decorated like a typical Russian wooden cabin in the country and serves an excellent business lunch menu. We could not read the menu and the water could not speak English, but we were able to figure out the main ingredient in each option, so we ordered that way. While we are waiting for the first of out three courses to arrive, we go and check out some of the interesting features of this restaurant. Other then the general decor, they include a full-size stuffed bear and a room with a glass floor with an aquarium below. In the aquarium are swimming large sturgeons. The food turns out to be very good and very filling and the service friendly and helpful. We were even able to communicate to them that we were in a rush and had a train to catch. We paid up and then headed to the door to exit, when we discover that it is raining very heavily. The doorman suggests we sit down and wait, but we have no choice - the train will not wait for us. So, we pack away our valuables in zip-lock bags and then run for the hotel. As we have about five long blocks to run, we get drenched. Also, the streets are flooded, so at some points we are walking through water up to our ankles as we cross at intersections. We get back to the hotel just before 1:30 PM and need to rush to finish packing our bags and check-out. We have arranged a transfer to the train station and our guide is waiting for us when we come down. Then we all pile into the car (the rain has turned into a drizzle) and head to the station. But we soon run into a mess. It turns out that the Prime Minister of Russia is visiting today and the streets are a mess. Police are everywhere and so many of the streets are blocked off. At one point, traffic comes to a complete standstill and we are stuck for what seems like ever. The clock is ticking. But soon the convoy drives by with lights flashing and sirens blaring and we are able to head on our way again. 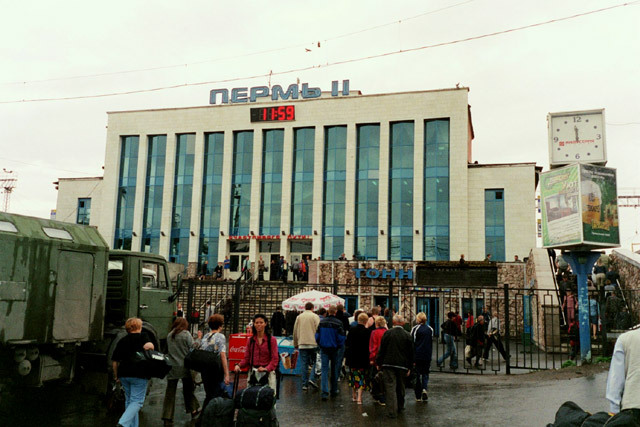 We arrive at the station - Perm II - shortly after 2 PM and grab our bags and make our way to the platform. We are on the first platform and it is a long train, so we have a long walk to get to our car in the middle of the train. This train originates here and is named after the famous bicycle manufactured here - the Kama. 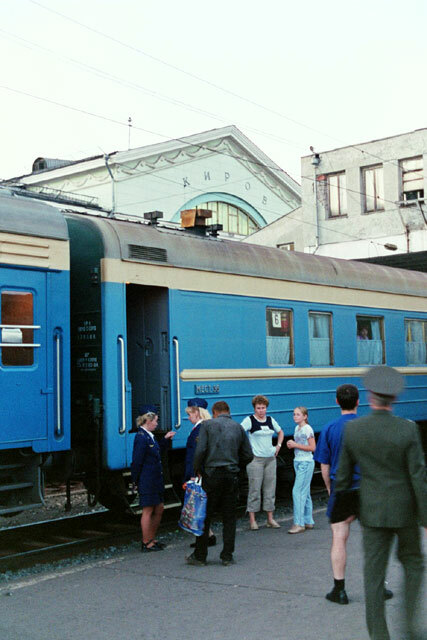 The provodnitsa checks our passports and tickets and then lets us board the train and settle into our compartment. A few minutes later, our interpreter from yesterday, Irina, comes by to wish us farewell. Due to the traffic jams, she had not been able to meet us at the hotel. That was really nice of her to come by and send us off. 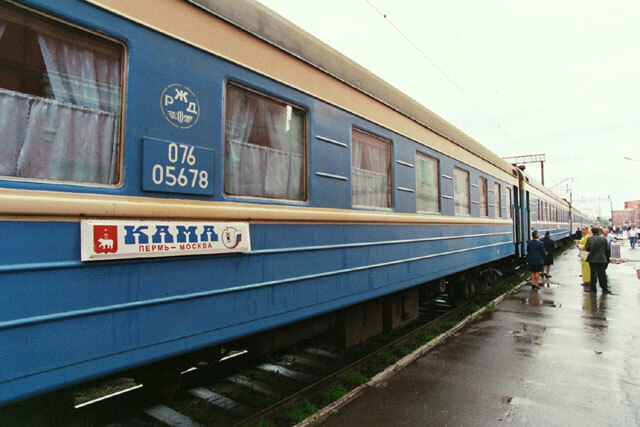 Train #017 - the Kama - departs right on time from Perm 2 - 1524/1225 - KM 1,436/7,853 at 2:25 PM to the sound of martial music blaring over the loudspeakers. It seems each city is very proud of the trains that originate from there and make sure they get a good sending off. 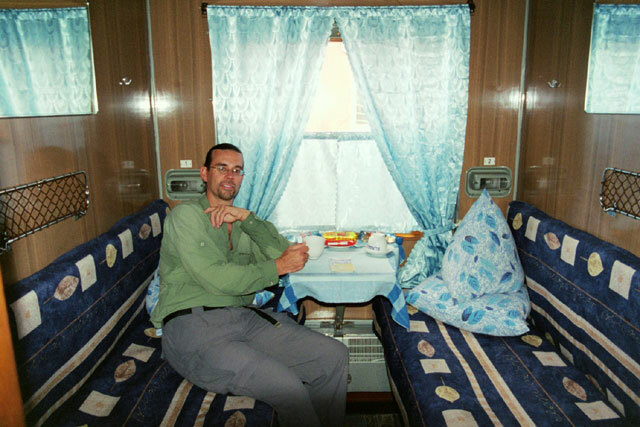 Well, we settle back in our compartment and make ourselves comfortable. The provodnitsa comes by to collect our ticket and collect the couple of dollars for the clean sheets they supply us. The train proceeds along at a good clip and the weather slowly improves as we head west. The other thing that we have noticed that seems to improve as we head west are the toilets, and this is on the trains and planes and in the hotels, restaurants and homes. The only problem with this train is that the TVs in each compartment seemed to be in active use and the compartment next to us has rented a number of movies from the provodnitsa. And they are playing the horribly dubbed movies at maximum volume with the thin walls providing very little barrier for the sound. Fortunately, the volume drops off around 10 PM. The train makes a number of stops along the way. Our first stop is at Vereshchagino - 1628/1428 - KM 1,310/7,979, a small station with an unremarkable concrete station. Shortly after we depart this station, we cross through yet another time zone. We now have only one more time zone to cross through before we are on Moscow time. Then our watches and the train timetables will be on the same time. But Lars' watch with both analog and digital faces came in very handy - one would be on local time and the other on Moscow time. Important if we want to make sure we do not want to miss a train or misread the timetables on the trains. Our next stop at Balyezino - 1711/1611 - KM 1,194/8,095 is a longer one and we get out to stretch our legs and see what may be for sale on the platform. But there are very few vendors and the selection is limited, with flowers, beer, some fish and chicken with potatoes. It is a small station. Once back on the train, we decide to have dinner. We are trying to keep on Perm time, so we can go to bed early as we have an early arrival in Vladimir tomorrow morning. Our dinner is potluck. We have our last packets of instant noodles, along with some bread with nutella. This is followed by a bag of pistachio nuts (good and cheap here), along with a bottle of Georgian wine we picked up in Kungur yesterday. The next stop is at Glazov - 1805/1705 - KM 1,165/8,124, a short one at a small dreary station with nothing to offer us. The next stop at Yar - 1845/1745 - KM 1,127/8,162 is pretty much the same. 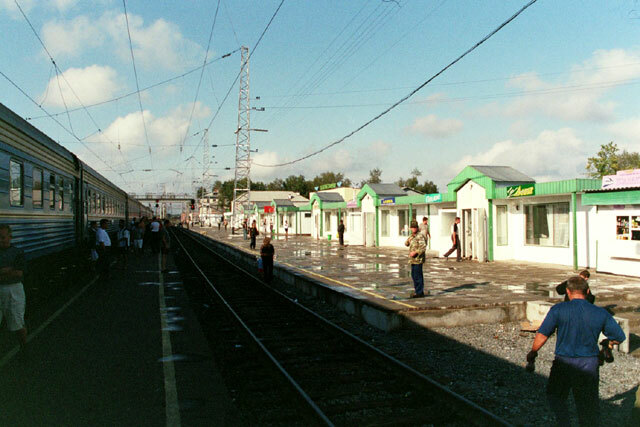 At Zuevka - 1935/1835 - KM 1,052/8,237 there is a lime-green steam engine and station building. But the stop is short, so we have no time to get off and check-it out further. 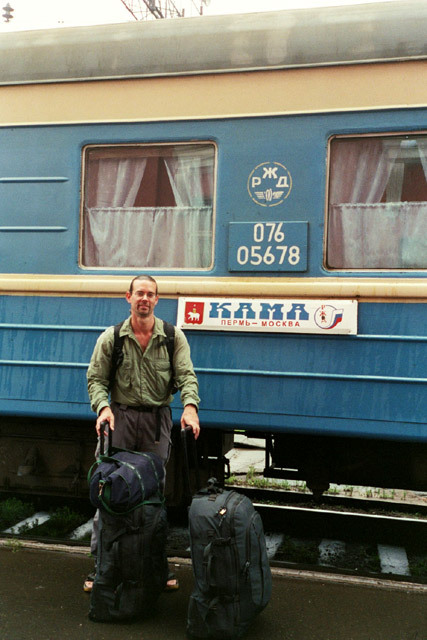 Our final stop of the evening before we retire for the night is at Vyatha/Kirov - 2105/2005 - KM 957/8,332, where we have a long stop, but there is nothing to interest us. No vendors and a run down station building. We get back on the train and get ready for bed. We arrive in Vladimir tomorrow morning before 6 AM, so it is time to go to bed. We will, however, go through another time zone during the night, so we will gain another hour of sleep.